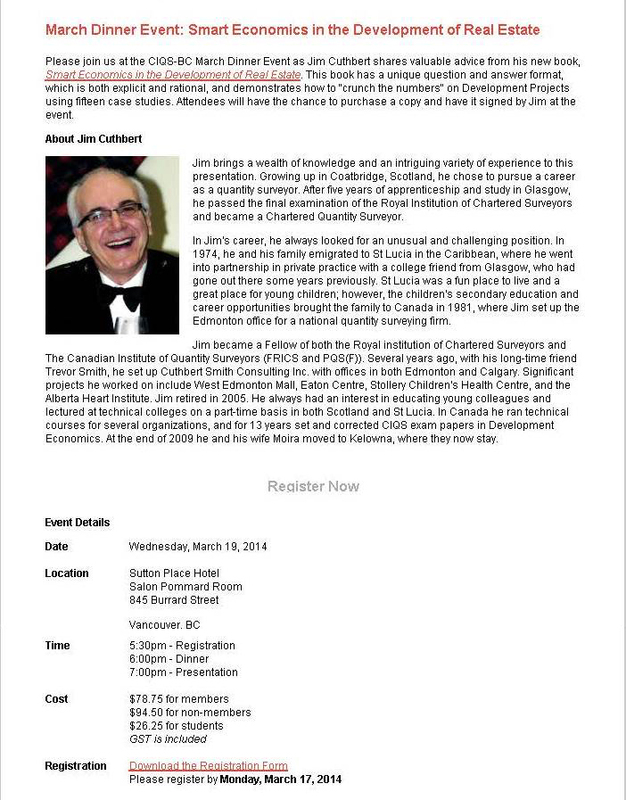 The Canadian Institute of Quantity Surveyors (CIQS-BC) is hosting a March Dinner Event. Guest speaker, Jim Cuthbert, shares valuable advice from his new book, Smart Economics in the Development of Real Estate. This book has a unique question and answer format, which is both explicit and rational, and demonstrates how to “crunch the numbers” on Development Projects using fifteen case studies. Attendees will have the chance to purchase a copy and have it signed by Jim at the event. The event takes place on Wednesday, March 19, 2014 the Sutton Place Hotel. Click here for more information. Click here to download a registration form.